"When the world of our hopes and dreams does emerge, it will be because we treat each other as friends and build communities based on hospitality rather than on competition." 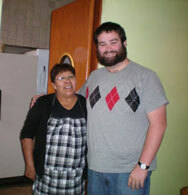 Brendan Carey, a recent graduate of Stonehill College, is anAssociate Missionary of the Assumption (AMA) for 2009-2010. He lives with the Assumptionists at Casa Manuel in Mexico City and works at a house of hospitality (albergue) that lodges people (and their families) who are receiving medical treatment in the city. We share with you some of his reflections after three months of being there. Mexico, home to some of the lowest labor standards in Latin America, jails full of people whose only real crime is being poor, transnational corporations that dominate natural resources and workers' lives, is also home to one of the world’s richest men (Carlos Slim), and the 12th largest national economy in the world. Thus, it is easy to see the inequality, injustice, and violence that is the cornerstone of our global economic system. It is also humbling to realize how privileged I am in this very system that I condemn. I have benefited greatly as a middle class American while the vast majority of the world has suffered to support my lifestyle. And because of this, even as I am here in DF attempting to live in solidarity with the people that have been forgotten and left behind by “economic development” and “progress,” there is a gap between them and me that I cannot cross just by being here. In a lot of ways, I see the distance between myself and the people I am working with when they ask me why I am here. It is a common question from the people at the albergue because people don’t really know why I would come here to work, while most people that they know are trying to cross the border in the opposite direction. The people from Mexico who are crossing to the United States don't share the privilege of choice that I have. They usually cross for economic or political reasons, arenas of life of which they have no say in determining. I am realizing the irony that it is my choice to come here to work with people who lack the ability to choose the direction for their own lives. I think that the word to describe what I feel from these interactions is responsibility, not guilt for the violent system that denies dignity and choice to some while others are guaranteed rights and luxuries, but responsibility to do something about what I am seeing. What I have started to realize is that the reason I am here is not only to do the physical work of the albergue (although that is important), but also to take advantage of the opportunity to interact with the people through this work. What I am really here for is to experience friendship, hospitality, and community. In the society based on power and inequality in which we live, to value personal relationships with people and truly be a part of a community is revolutionary. It is revolutionary in a non-traditional sense; it isn’t going to change the world but rather this idea creates a new world. If we can actually imagine and create a world where hospitality and friendship are the primary principles by which we interact, then the powers and inequalities of today just won’t be relevant tomorrow. In some ways I am overwhelmed by the state of the world today with wars, corporate greed, environmental degradation, etc. I am also frustrated with my own place in all of this injustice and destruction. But I can’t help but have hope when I go to the albergue or spend time with the guys at Casa Manuel who have now become my friends. When the world of our hopes and dreams does emerge, it will be because we treat each other as friends and build communities based on hospitality rather than on competition."